The church that I belong to is going through a pastoral transition this year. That’s because our senior pastor, who is also a good friend, is in the process of turning over the leadership of the church to the younger pastors on staff. He isn’t retiring as he still has a significant role in our small denomination and will also remain as part of our pastoral team for a few more years. I mention this because my pastor/friend has been serving in ministry for over 30 years! During that time, he has pastored at only two churches and has served our church for over 20 years. I am grateful for those many years of friendship and pastoral care. You may have someone like him in your church or life. I certainly hope so – men like him are a gift from God. Another thing that I respect him for is his wisdom. He is one of the wisest men I know. He has acquired wisdom through a lifetime of devotion to God and pastoring God’s people with humility, love, and compassion. He continues to serve in the local church and beyond because we need his wisdom. The younger pastors need it, so does our congregation. The pastors in our other churches do too, as do the men he serves alongside in leading our denomination. Wisdom is highly valued in Scripture: “…for the gain from her (wisdom) is better than gain from silver and her profit better than gold. She is more precious than jewels, and nothing you desire can compare with her” (Prov.3:14-15 – ESV). According to the Bible, wisdom is a precious commodity; it is to be desired more than any precious jewel. We should exercise stewardship of the precious wisdom we have received in all stages of life. A pastor can be young and hip, good-looking, an excellent speaker, and even have multiple advanced degrees, but lack wisdom. That’s because real wisdom comes from God, gradually over a lifetime of experience. “For the Lord gives wisdom; from his mouth come knowledge and understanding” (Prov.2:6 – ESV). Because he is wise, my friend would be the first to tell you that wisdom isn’t something that comes easily or naturally. We aren’t born with it; it is acquired and matured over time. And although wisdom is not exclusive to older people, the Bible does say that “Wisdom is with the aged, and understanding in length of days” (Job 12:12 – ESV). But precisely how is wisdom acquired over time? As we will see, mainly over the course of a lifetime of experience as you gain knowledge and understanding in accordance with Biblical truth. If you are a Christian, it is likely that you have sought to understand and interpret your experiences and the circumstances of your life based on a Gospel-centered, Biblical perspective. Hopefully, that has produced in you an abundance of practical knowledge and Biblical wisdom along with unshakable confidence in God’s love and sovereignty (Heb.10:23). Jesus established the pattern for us to follow in our own lives, which I’ve tried to illustrate in the diagram. It is the pattern that I believe my pastor friend has followed. Although I have depicted this as a serial progression, it isn’t. The process is more iterative – we constantly have new experiences that further clarify and refine our knowledge and understanding and hopefully increase the wisdom we have gained from them. These three words – knowledge, understanding, and wisdom – are often found together in Scripture. They are essential to our understanding of how we mature in the faith and what our role in the life of the church should be as we age. Possessing them equips us to serve others faithfully, especially those younger than ourselves. To know wisdom and instruction, to understand words of insight, to receive instruction in wise dealing, in righteousness, justice, and equity; to give prudence to the simple, knowledge and discretion to the youth—Let the wise hear and increase in learning, and the one who understands obtain guidance, to understand a proverb and a saying, the words of the wise and their riddles. The fear of the Lord is the beginning of knowledge; fools despise wisdom and instruction…My son, if you receive my words and treasure up my commandments with you, making your ear attentive to wisdom and inclining your heart to understanding; yes, if you call out for insight and raise your voice for understanding, if you seek it like silver and search for it as for hidden treasures, then you will understand the fear of the Lord and find the knowledge of God. For the Lord gives wisdom; from his mouth come knowledge and understanding; (Prov.1:1-7; 2:1-6 – ESV). It is important to note that there are different kinds of wisdom, understanding, and knowledge. There is the natural, material, and worldly; and there is the spiritual kind. What I am talking about here is a combination of both. We need both the practical knowledge and wisdom that helps us navigate life in a complex world, but it is wisdom in spiritual things that will make the greatest difference in our lives and the lives of others. That is why the Bible tells us to “Get wisdom; get insight…The beginning of wisdom is this: Get wisdom, and whatever you get, get insight” (Prov.4:5-7 – ESV). Wisdom and insight (understanding) are to be highly sought after. Think how valuable wisdom is when you are confronted with the most complex and challenging circumstances and problems in life. Consider the couple who is experiencing the pain and anguish of the rebellion of a wayward child. How can you help them with the situation and work through the hurt and pain? What hope and assurance can you offer? You will have the greatest impact if you offer a scripture or counsel that springs from the deep recesses of your own heart and soul because you too have experienced such hardship and also God’s mercy in the midst of it and therefore has real wisdom to share. I have some friends, a dear couple who recently lost their young adult son. He had battled significant health problems his entire life. He was a strong believer, and an example to all who knew him, but what do you say about something like that? What do you say to that couple and family who has lost a beloved son? How do you bring hope and assurance in the midst of such great sorrow and loss? It can only be done through wisdom, and in this case, wisdom flowing from heartfelt love and compassion based on a deep understanding of the hope and assurance that the Bible gives to those who know Jesus. If you are older, when it comes to wisdom, you have a lot more going for you than you might think. You have gained knowledge and understanding through experience, and in the process, God has given you wisdom. 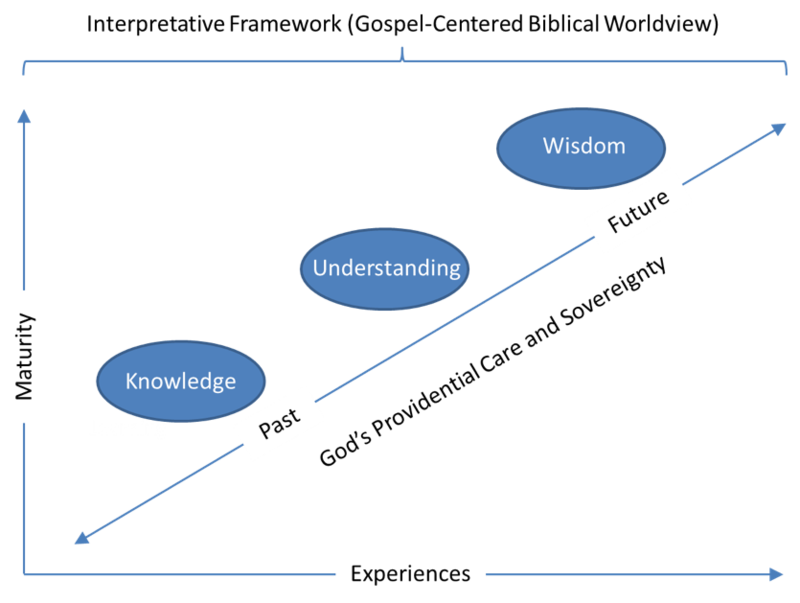 So let’s take a closer look at how you got there by looking back at the “wisdom continuum” because the journey is as important as the destination. Though experience can be the best teacher for some things, life is way too short to learn everything by experience! We can save ourselves a lot of trouble when we learn wisdom lessons the easy way – by listening to the insights of those who have already traveled down the road. If you are one who has traveled that road, then you have learned the hard lessons that experience teaches. Mr. Sweeting is talking about the lessons learned by older people who have lived long enough to experience the different seasons and circumstances of life. You have known disappointment, hardship, and loss as well as blessing and abundance. You have learned much from your experiences, but most importantly, you have experienced God in and through them all (Joshua 1:9, 2Cor.4:15, 12:9-10; 1Thess.5:18). Acquiring understanding and wisdom begins with accumulating knowledge. Knowledge is typically thought of as mainly academic. You read or study something, usually information and facts about subjects/issues, and if you retain them, you have gained knowledge. You can study subjects such as math and science, or you can learn a specific skill or trade. You can explore the Bible to learn doctrine and theology. The Bible also teaches us how to live (2Tim.2:15). Academic knowledge is important, but from a Biblical perspective, knowledge is better understood as a deep and insightful comprehension of life that is rooted God’s Word as it is applied to life experience. This is the knowledge that leads to understanding and wisdom. We don’t accumulate that kind of knowledge just for knowledge’s sake. Our goal isn’t to become smarter; it’s to become wiser. Only knowledge of God and a knowledge of life can give us understanding and wisdom (Prov.1:7; Prov.2:6, Psalm 119:66, Col.1:9-10). Knowledge must lead to understanding and wisdom before it becomes truly useful to us. “Let the wise hear and increase in learning, and the one who understands obtain guidance” (Prov.1:5 – ESV). One definition of understanding “is to have the power of comprehension; to achieve a grasp of the nature, significance, or explanation of something” (Webster). Proverbs seems to equate understanding with insight. If you have gained understanding, you can attach meaning to knowledge. You can see beyond information and facts to the what, how, and why of something. As we gain understanding, we increase our ability to distinguish and discriminate; we more rightly perceive the true nature of things. There are two ways to view understanding: Man’s understanding (humanistic, man-centered) and God’s understanding (from God and of God). Man’s understanding will always be inaccurate or incomplete. But the life-knowledge that God gives helps us to understand the way things are. “Trust in the Lord with all your heart, and do not lean on your own understanding. In all your ways acknowledge him, and he will make straight your paths” (Prov.3:5-6 – ESV). But knowledge and understanding alone are not enough – we also need wisdom. Of the three, it is the greatest prize, the “pot of gold” at the end of the rainbow. (Actually, as we saw in Proverbs 3, it is greater than gold!). 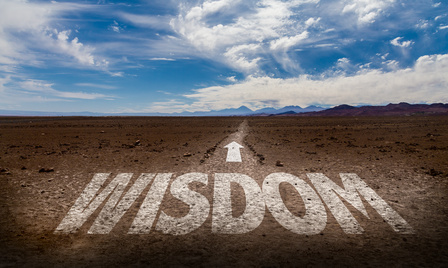 A good definition of wisdom in the Bible can be found in Prov.9:10 – ESV: “The fear of the Lord is the beginning of wisdom, and the knowledge of the Holy One is insight.” True wisdom begins with knowing and fearing God. A sensitive, mature judgment or discernment of how the fear of the Lord should work itself out in all the circumstances not specifically dealt with in the Bible…it [refers] to that practical knowledge of how to attain true and lasting happiness. It begins with the fear of the Lord and consists in humbly hearing and doing God’s will perceived both in Scripture and in the unique circumstances of the moment. Such wisdom is essential because the person who has it finds life and joy, but the person who doesn’t finds death and misery. Wisdom is not only for ‘deep thinkers.’ It is how you get through daily life…Wisdom will guide us as we grow in the knowledge of his Son, Jesus Christ, who is Wisdom itself…It is making the right choice even they there are no clear moral laws telling you what to do…no Bible verse will tell you exactly whom to marry, which job to take, or whether to move or stay put…To become wise is to become a disciplined person, given not to impulsiveness, but to self-examination, to circumspection, and to clear thinking…It is to become a resilient person who through hard knocks has become poised and resourceful…As an athlete becomes physically competent only after rigorous training, so wisdom is hard won. Wisdom is so highly valued because it is needed in all areas of life. The insights that wisdom gives us help us find ways of dealing with life and all its questions, challenges, and problems. When confronted with a situation or a problem, wisdom helps us to know what to do next, as long as we have knowledge of the facts and an understanding of the situation in the first place (Ecclesiastes 8:1, James 3:17). There is a connection between maturity and wisdom. We all “mature” in the sense that we get older, but not all “mature” in knowledge, understanding, and wisdom. That’s why some young people are more mature than others, and why some older people are not as wise as they could be. As we grow older, we should increase in wisdom to the extent that we have gained real-life experiential knowledge and understanding of what the Bible teaches. Such wisdom helps us better understand our successes as well as our weaknesses and failures and gives us a different perspective looking back than those who can only look ahead to an unknown future (Eph.4:11-14, Heb.6:1-4). If you have wisdom, you have a level of discernment and perception with the ability to think and act appropriately using experience, knowledge, understanding, common sense, and insight. If you have acquired this kind of wisdom, you are eminently qualified to help those who are in need of it. Imparting wisdom is something you can do by remaining engaged in your church and community, and even in the world. The ability to apply wisdom in our own lives and then to impart Godly wisdom to others is a great privilege. The world has one view of growing old; the Bible has another which is that “Gray hair is a crown of glory; it is gained in a righteous life” (Prov. 16:31). Perhaps you are entering your latter years with a sense of weakness and failure. You may have regrets (most of us do). But here’s the thing – weakness and failure teach wisdom lessons just as well as strength and success. Don’t believe the lie that past failures disqualify you from helping others and certainly don’t accept that they guarantee fruitlessness in the future. You can, with older saints everywhere, pray, “Do not forsake me, until I proclaim your might to another generation, your power to all those to come” (Ps. 71:18). Who can you serve by giving them the benefit of the wisdom you have acquired over your lifetime? To start, you can help your own adult children and grandchildren. You can also spend time with younger people in your church. There are also opportunities in your community to get involved with children, young couples, and families. The main thing is to try to avoid spending all your time in a familiar, comfortable circle of same-aged peers. Look for opportunities to spend time with others who can benefit from your wisdom. Finally, balance advising with merely relating; avoid the two extremes of relational detachment and overly involved micromanagement. Many younger Christians want relationships with older godly men and women. They want friendships that are real and transparent so that they are comfortable seeking them out in times of real need. You can be that person – will you be?